I really have nothing to say to this image gallery detailing the world’s first eyeball tattoo. Well, nothing to say except, “Ewww, gross!” That’s not very helpful, I know, but it’s the first thing that springs to mind when these horror-movie quality images reveal themselves. The man is apparently from Toronto, and the process took 40 injections of blue ink into his eyeball. From what I remember from my dad’s laser vision correction surgery, the eye doesn’t actually feel pain, but I guarantee you he had to look up and watch as that needle came closer… and closer… and closer to his unprotected eyeball and had to not blink. I mean, we’ve talked about some weird tattoos here at PopFi, but this is the weirdest of the weird. The first thing I thought of when I saw one of the shots in that gallery was of Lucio Fulci’s 1981 movie, The Beyond, which is infamous for a particular scene involving an eyeball and some gouging. There’s also a scene in Takeshi Miike’s 1999 classic Audition that involves acupuncture needles and the eyeball that is also incredibly cringeworthy. 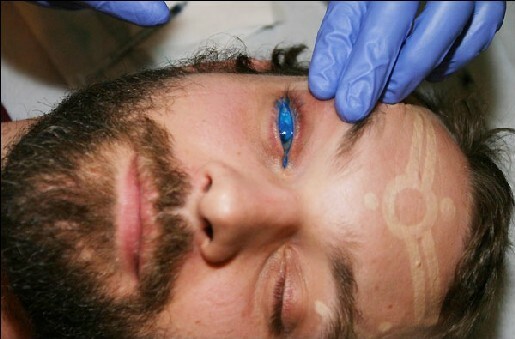 Maybe I’ve seen too many horror movies, but that eyeball tattooing process made me shudder!